We read some verses in Qur'an but we are not attentive for its meaning, one of those verses is: (He brings out the living from the dead), let us read …. One of our brothers sent me an article which was published in the "Guardian newspaper" dated (12/6/2008)about some dates which are 2000 years old, as the scientists found them in the castle of an old king in Jordon. Then they started to sow it to make it grow up and it grew!! Scientists were astonished about that, so they started to study this phenomenon but unfortunately they got nothing. After studying of these seeds they found that the seed contains a special program to make it ready to back again to life at any time. Scientists were asking, who put these programs? How did it get the power to back again to life just when it finds water? How the seed can produce the same plant as the palm seed produce palm tree and the grape seed produce grapes tree? Who taught those seeds to do that job without any mistake? He is Allah almighty who said: (He brings out the living from the dead, and brings out the dead from the living. And He revives the earth after its death. And thus shall you be brought out (resurrected).) (Sûrat Ar-Rûm- verse 19). Grains of dates,(2000 years old) which were found in the castle of King Herod near to the Dead Sea. Source (science magazine). Scientists were astonished that despite the long years but seeds of dates still in good condition and can be grown. Three years ago, the scientists had sow those seeds in soil under suitable conditions and they processed it by a special hormone to make it grow up, now it is a palm tree with height up to 1.5 meter. Scientists confirm that many kinds of seeds can stay for years if it got the suitable condition. 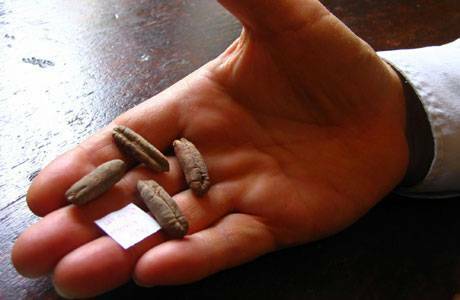 Scientists tell us that this kind of seeds is the oldest kind ever discovered till now, they found seeds of the lotus which are 1300 years old and they succeeded to germinate it in special laboratories. But seeds of palm tree have a strange ability to stay alive, it is a blessed tree, God says: (And we send down blessed water (rain) from the sky, then we produce therewith gardens and grain (every kind of harvests) that are reaped. * and tall date-palms, with ranged clusters. * A provision for (Allah's) slaves. And we give life therewith to a dead land. Thus will be the resurrection (of the dead). )(Sûrat Qâf-verse 9-11). Palm tree which had been germinated from seeds that have 2000 years old, its leaves grew up after eight weeks. These seeds started to split and grow up to produce a complete plant just after it received water. Scientists are asking a question about these seeds, how can it gets the needed power to split and double the cells till it became a complete tree that contains millions of cells?!! God says: (Verily! It is Allah who causes the seed-grain and the fruit-stone (like date-stone) to split and sprout. He brings forth the living from the dead, and it is He who brings forth the dead from the living. Such is Allah, then how are you deluded away from the truth?) (Sûrat Al-An’âm- verse 95). Atheists are asking: if the man died and his body had decomposed, how can he come again to life after millions of years? Allah almighty by His power put the ability in the weak seed to stay and to afford the hard circumstances (temperature and moisture)to be as an evidence that Allah is able to revive the dead, Allah says: (Look then at the effects (results) of Allah's Mercy: how He revives the earth after its death. Verily, that (Allah) (Who revived the earth after its death) shall indeed raise the dead (on the Day of Resurrection), and He is Able to do all things.) (Sûrat Ar-Rûm- verse 50).